Despite having made my profession as a writer of various persuasions for most of the past decade, my reading list has been shamefully thin on the ground. Finding time to read seems to be more difficult and less appealing than ever, particularly when the other option is to vegetate on the sofa while watching reruns on Netflix. This time six years ago I somehow managed to devote a worrying amount of time to reading Robert Parker’s Bordeaux cover to cover. That tome, all 1,200 or so pages of it, took a year to read at a pace that was, to be honest, as good as a few pages here and there until I’d had enough of Parker’s constant use of the phrases ‘blockbuster’ and ‘sleeper of the vintage’. Informative as it was, it was also an excellent sleep aid. Since then I have somehow managed to read several other dry books on wine, but as the years have passed by, my ability to complete them — or even make it more than a few pages in — has diminished. I never did managed to read the entirely of the World Atlas of Wine, informative and valuable as it may be. But I do like to refer to the maps on occasion. No matter what I read, a book needs to give me a reason to keep reading it. If it fails to grab my attention, to entertain me, to pull me into its narrative and hold me there until the final page, I can put it down and quickly forget about it. Some books I read quickly; other books will remain in limbo for several years as I dip in and out of their pages when I can be bothered to think of them. This is why I never did finish the Mayor of Casterbridge. I read Far From the Madding Crowd many years ago when I still had the patience, whereas the Mayor of Casterbridge tested my patience one too many times. Wine books are no different from any other. They either pull me in or they push me away. I sincerely doubt I would have the patience to read another of Parker’s imposing reference books, for example. But give me something with a story to tell, a dash of wit and humour, and we’re in business. 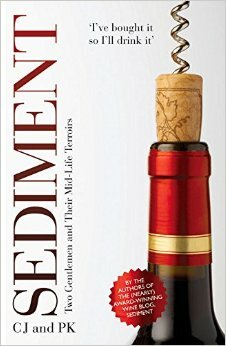 This is the case for the only wine book I have managed to read in its entirety in the past year was Sediment: Two Gentlemen and Their Mid-Life Terroirs. As I have also written for 12×75.com, this is a wine book that raises topics and views that are seldom seen among the wine press. It speaks to several audiences at once, from the everyday wine drinker who simply wants to know whether or not they should attempt to drink wine out of a box, to the sophisticated collector who has a sense of humour. While the book is based largely on posts that have appeared in the blog, the adaptation works because few of us have probably read all of their previous posts. There are times when a compendium is a good thing. I devoured this book in a couple short sittings. In other words, on the seats of two discount airlines in early December. What would normally have been an uncomfortable hour and a half being flogged duty-free products and scratch cards by bedraggled flight attendants, I simply zoned them out and buried my head into the world of CJ and PK. Sediment explores with humour and humility the minefield that is buying and drinking (and less frequently investing in) wine, whether it is bought in bulk from a co-operative in the south of France, a Germany discount retailer on the UK high street or from a merchant in St James’s Street in London. I’m a big fan of the Sediment blog. I’ve been meaning to get a copy of this for some time now. I have read 99% of their output though – would you still recommend it? Hmmm. If you’ve read all of their blog entries, you might not need to buy the book (maybe CJ and PK can confirm). There were things in the book I hadn’t read before, so it was a worthy read even if a few articles were updated versions of things I had read before.